"The Greatest Success of All"
"Skipper, a special message just came in for you from the admiral,"
the sailor said to his captain as he saluted. "I have it right here." "Read it to me," the captain ordered. The skipper responded, "Have that communication decoded at once!" For some people, it's all about them. For others, it's all about you. who walk in and say, 'Ahh, there you are.'" image of success with the image of service. share the happiness of others. Faith in God erases sin’s power over our lives. Faith is simply, trust. When we believe in Jesus Christ, we stop trusting in our own judgments about ourselves or our lives--whether those judgments evidence egomania or self-loathing, it doesn't matter--and instead, we trust in God’s grace, the charitable acceptance He gives to all who turn from sin and trust in Christ. But should South Korea have agreed to prevent Christian workers from entering Afghanistan? Sagging pants are becoming illegal in some parts of the country. I wrote about the phenomenon back in April. Chef and entrepreneur Aneh Mundi is a fascinating person with a commitment to wholesome, healthy, and convenient foods, to Jesus Christ, and to combatting HIV, which is devastating the African continent. During the latest episode of my brother Marty Daniels' Humble-o-Radio, he conducts a fascinating interview with Aneh. She talks a little bit about her journey from Cameroon to Wisconsin. She also talks about food, nutrition, eating healthy, and how her commitment to Jesus Christ led her to help combat AIDs in Africa. Go here to listen. My brother-in-law Dan tells the story of what happened when a friend of his was on the telephone with a Japanese businessman and a translator to negotiate a deal. During the course of the conversation, the Japanese man would say, “Hi” repeatedly. Confused and a little annoyed, Dan’s friend nonetheless decided to be friendly. Every time the Japanese businessman said, “Hi,” he said, “Hi” back. Soon, their transaction completed, the Japanese businessman hung up. With just the two of them on the line, the translator asked Dan’s friend, “Why did you keep saying Hi?” “Because,” Dan’s buddy explained, “he kept saying it.” The translator laughed and explained that the Japanese word, “hi” is an expression of agreement. The meaning of words can often be lost in translation. One of the things that keeps the growing legion of spiritually disconnected people in America away from Christ and the Church is that we Christians often seem to speak in a foreign language. I’m not talking about the spiritual phenomenon of “speaking in tongues,” which some churches emphasize. I’m talking about the terms that Christians use, words that are used nowhere else or that are used completely differently by the rest of the world. Theologian Gerard Sloyan once upbraided Christians for using “religionspeak,” which he described as the native language of a land where nobody lives. Still, it’s true that because in both the Old and New Testaments and most especially in Jesus Christ, God has revealed a way of life totally foreign to the values of this world, it’s inevitable that some of our words or, at least, the way we use those words, will sound like foreign jibberish to outsiders. We Christians have to love our neighbor enough and want to share our faith with them enough to try to translate those words not just with our mouths, but with our lives. There are times too, when we need to take the time to recall just what these words are all about. No word in the Christian lexicon is stranger to the outside world than our word, grace. Now, we may all be able to give a quick definition of grace. We might say something like, “Grace is God’s undeserved gifts of forgiveness and new life, given to all who believe in Jesus Christ.” That’s an accurate definition. The first characteristic of God’s grace fairly screams out in the story Jesus tells in today’s Bible lesson. In it, a wealthy landowner goes into the village square, where there are people looking for work. He hires some to work in his vineyard. The pay is the going rate for the time, a silver coin. Three hours later, the landowner goes to the village and hires more workers. He does the same thing at three in the afternoon. Then at five, quitting time, he goes to the square and puts a few more on the payroll. At the end of the workday, the landowner gathers all of the day’s hires in order to pay them. Each and every worker, no matter how long or even if they’ve been in the vineyard, gets the same payment, a single silver coin. 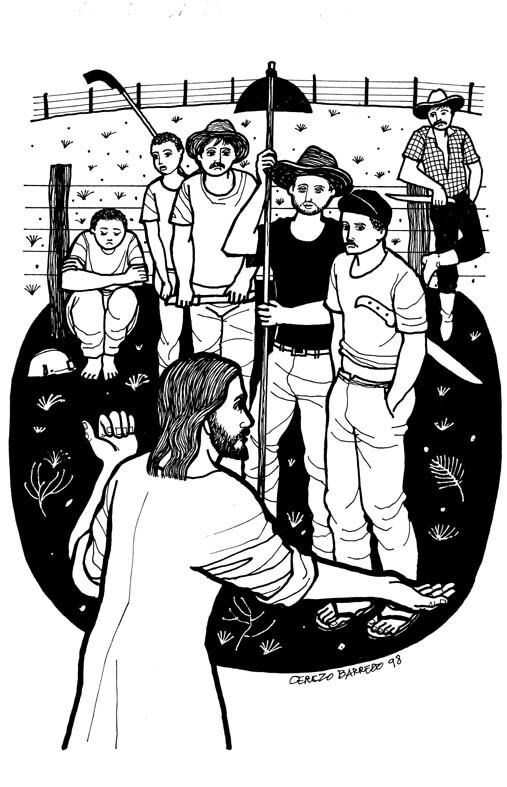 The workers in Jesus’ story demanded that the landowner give them what they deserved. We often do the same thing with God. I know that I do. But if God gave me, a sinner, what I deserve, I would go straight to hell. As it is, because of what Jesus Christ did on the cross and because He rose to ensure that all who believe in Him won’t be in hell, separated from God, I can work in God’s vineyard--I can be an active member of His Church and an active participant in society--knowing that at the end of my life, God will give me the eternity with Him that I do not deserve. The apostle Paul famously writes in the New Testament that, “the wages of sin is death, but the free gift of God is eternal life in Christ Jesus our Lord.” That is grace: God unfairly accepts all who turn from sin and follow Him. And He unfairly offers this to every human being on the planet! Another characteristic of God’s grace is this: The grace that changes us from enemies to friends of God only comes from Jesus Christ. It can be found nowhere else. Among all the deities and religious systems people worship in the world, it’s only the God chronicled in the Bible, who ultimately discloses Himself in Jesus Christ, Who offers us the charitable and blessedly unfair grace of God! The Hiding Place is Corrie ten-Boom's remembrance of how she and her Christian family helped Jews to escape Nazi-occupied Holland during World War Two. They were eventually found out and imprisoned, Corrie being the only family member who survived life in a Nazi death camp. And then, with tears streaming down her face, Aunt Jans prayed, “Dear Jesus, I thank You that I must come with empty hands. I thank You that You have done all--all--on the Cross, and that all we need in life or death is to be sure of this.” The Gospel of John tells us that “grace and truth” come to us through Jesus Christ. It goes on to say, “No one has ever seen God. The only Son, Who is the same as God and is at the Father’s side, He has made Him known.” God has made it possible for us to fully experience and appreciate His grace when we trust Jesus Christ as the only One Who can give us real truth and real life. Now, one more characteristic of grace: Grace gives us power for living this life. God’s grace is tough. Imagine the toughness required of God to not give up on the human race in spite of our massive, generation-to-generation rejection of Him. Imagine how much toughness it took for Jesus to go to the cross in spite of what He knew awaited Him there. Imagine the toughness it requires of God to forgive the repentant in spite of the ways in which we sin against Him and His children. What’s amazing to me is how God transmits His toughness to those who dare to follow Him! This too, is an act of God’s grace. I love the words of Martin Luther King, Jr., from a sermon he called, Shattered Dreams: “The Christian faith makes it possible for us nobly to accept that which cannot be changed, to meet disappointments and sorrow with an inner poise, and to absorb the most intense pain without abandoning our sense of hope, for we know, as Paul testified, in life or death...that 'all things work together for good to them that love God, to them who are called according to His purpose.'" You know, as a pastor, I’m the repository of many confidences. But if I could break the confidences of just the people in worship here this morning, your stories would, again and again, tell about how, even in the face of horrible suffering and difficult circumstances, the grace of God, given through Jesus, has sustained you. Through the grace of God, you’ve been able to face all that life has brought to you. My family and I have been learning again first-hand this summer just how amazing God’s grace is. We’ve felt God’s strength and encouragement, His undeserved love, through what has been an exhausting and sometimes emotionally-battering summer. Grace, with its assurance that God will never “forsake us” and is with us “even to the close of the age,” gives us the toughness to face this day and each day of our lives. God’s grace isn’t fair; it doesn’t give us what we deserve and accepts us no matter how far or how long we’ve wandered from God. Grace is made clear and available to all through Jesus Christ, God enfleshed, the embodiment of God’s grace and truth. The tough grace of God gives us the resilience to face life’s fiercest challenges, made stronger in faith, in resoluteness, and in the certainty that the God Who went to a cross for us will be with us always. No matter how ugly we may feel, no matter how much sin has distorted our lives, no matter how ugly our lives may sometimes become, God’s grace, offered to us through Jesus Christ, can heal our hurts, cover our sins, and make us new...forever. Next week, two words: sin and faith.